After a brief hiatus for the Donne vs. Eliot Play-In round (Donne moves on) and the Super Bowl (Ravens! ), Celebrity Blogger Week continues with the Rev. Laura Toepfer. If you think of Lent Madness from an Electoral College point of view, Laura is critical as she hails from California. She claims to be “boring” but her unofficial photo proves otherwise. Oh, and Maple Anglican has just released a new video recapping the final Play-In — don’t want to miss this one! The Rev. Laura Toepfer, entering her second year as a Celebrity Blogger, is the Managing Director of Confirm not Conform, an organization devoted to creating confirmation programs that celebrate questions and authentic faith. After seven years in college, youth, and parish ministry, in 2008 Laura became a Kiva Fellow and worked with microfinance agencies in Uganda before returning to her native California. She is the author of the curriculum Eat, Pray, Grow, produced by Every Voice Network—a program that is remarkably well-suited to a church Lenten series. She preaches regularly throughout the San Francisco Bay Area and often has snarky things to say about church on her blog The Infusion. She also has a thing about obituaries. How long have you been a CB? What do you like about doing this or what have you learned along the way? I was invited to be a Celebrity Blogger in 2012, which was a tremendous honor. And then I discovered it was a lot of work. Isn’t that the way with celebrity? You think it’s all about bon bons and fancy dress and adulation, and then you discover that it’s just a slog. What I learned along the way is that Tim was absolutely crazy to try to do this all on his lonesome for two years. How?! He must have given up everything else for Lent, except the coffee required to keep him finding Saintly Kitsch into the wee hours of the morning. What I’ve liked about this is when the saints I’ve written about have touched people — or done better than I expected. That’s what happened with Evelyn Underhill last year who, to my great surprise, took out Nicholas in the first round. I also learned that there’s not much of a market for Evelyn Underhill kitsch. I’m so boring it’s ridiculous. I don’t even have a ferret. Is reading obituaries a quirk or a hobby? I drink a lot of tea. I have two cats (Havana Browns, known as the Evil Cat Brothers) and three dogs. 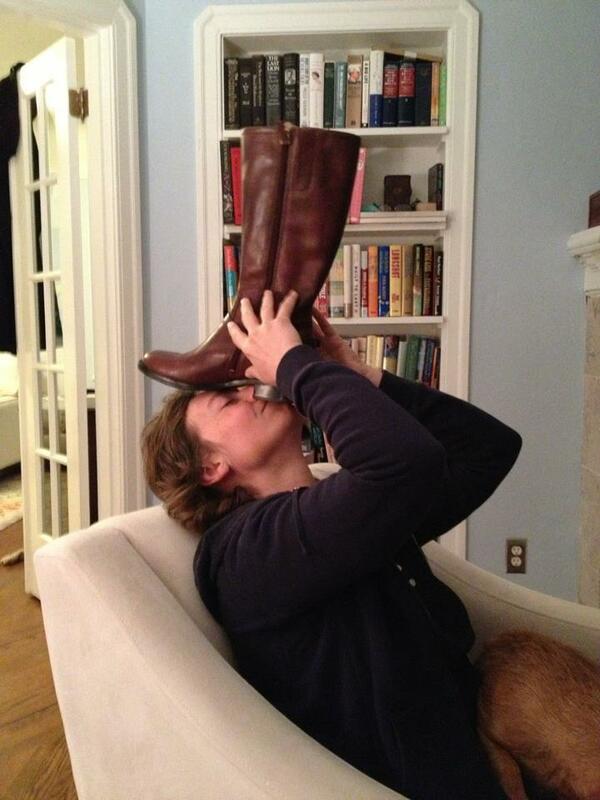 Also, I cannot balance a boot on my nose. Like I said, bo-ring. I should tell you about my fabulous sister instead. She owns a shop in Portland Maine, called Ferdinand. She does roller derby and plays drums in a band. She has a cool YouTube channel with quirky videos. See? Wouldn’t you rather hear about her? 9 Comments to "Celebrity Blogger Week: The Rev. Laura Toepfer"
My Havana Brown, Henry, sends greetings to the Evil Cat Brothers. Jack and Charlie return the greetings and ask if Henry wants to knock anything off a bookshelf with them. I’m sure that he and his best cat friend, Iona, would love to play! Well, I read the obits first thing every morning in the TENNESSEAN and if I’m not in there, I know I’m good for another day. When I pick the NYT at STARBUCKS, I read the obits in there first because that’s where the best writing is practiced. Rev. Laura has the right credentials as far as I’m concerned….too many animules but classy boots and a good pair of boots will take you anywhere you even think about going. Go, Donne !!!!! I’m delighted to know that someone cool has created a confirmation curriculum…. and I’m very impressed with the Kiva fellow experience. Not boring. I will visit your sister and her shop. If I tell her I’m a fellow celebrity blogger, will she have any idea what I’m talking about? Should I keep it on the DL? She probably won’t have a clue about Lent Madness, but do tell her I sent you. She’s very cool, my sister. Anyone who has a sister that makes knitted pickles with eyes has got to have terrific insite into the saints! Plus, she might be a great help if you need last minute kitsch for saint . . . I’d definitely keep her in the Lent Madness loop!